The Milwaukee Bucks are positioned to enter the NBA playoffs next month with as good a chance at a title in recent memory, but they’ll have to begin their run without one of their most efficient shooters. 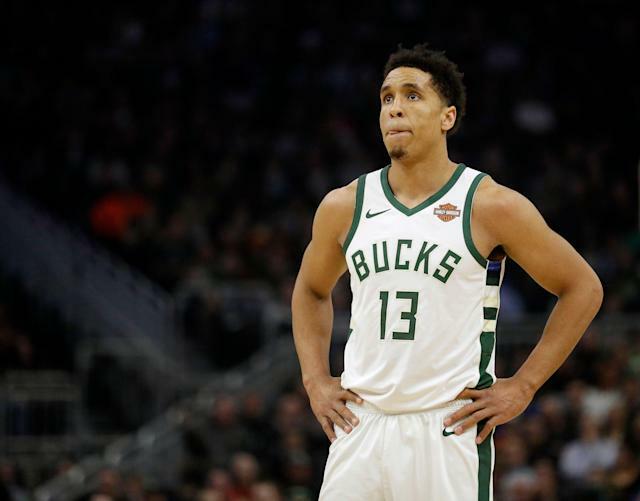 Bucks guard Malcolm Brogdon was diagnosed with a minor plantar fascia tear in his right foot after undergoing an MRI on Saturday, the team announced. Per ESPN’s Adrian Wojnarowski, the injury will sideline Brogdon for six to eight weeks. Brogdon exited Friday’s game with what was announced as right heel soreness after going 0-for-3 from the field in seven minutes. A timetable of six to eight weeks rules out any return in the regular season, which ends in less than four weeks for the Bucks. If Brogdon were to come back in exactly six weeks from Saturday, that would be an April 27 return, roughly around the end of the first round and beginning of the second. While the loss of Brogdon would normally mean more backups for Donte DiVincenzo, it’s worth noting that the Bucks have gone a little bigger in the past without Brogdon. In terms of how Bucks' starting 5 changes w/o Brogdon, note that they started Nikola Mirotic both to start second half vs. Heat on Friday and vs. Jazz a couple weeks ago when Brogdon (and Bledsoe) were out. Earlier this season Tony Snell started three games in Brogdon's absence. Whoever replaces him, the temporary loss of Brogdon is tough news for the 52-17 Bucks. Brogdon had been having a career year as Milwaukee’s starting shooting guard, averaging 15.6 points, 4.5 rebounds and 3.2 assists. He leads the NBA in free throw percentage at 92.8 percent, and his .505 shooting from the field and .426 from three-point range gave him the NBA’s only 50/40/90 shooting clip. While Brogdon’s season is over after 64 games played, he’ll still go down as just the seventh player in NBA history to post the 50/40/90 clip while qualifying for the league leaders in all three stats. He joins a group of Larry Bird, Stephen Curry, Kevin Durant, Reggie Miller, Mark Price and Steve Nash, the last of whom accomplished the feat four times. Of course, that milestone likely matters little to the player or team when they’re arguably the favorite to win the Eastern Conference at this point.